Highly upgraded Encanto II plan overlooking the 1st fairway of the Jerry Pate course offering alluring views of the west Santa Rosa mountains. Well positioned on a private cul-de-sac. Some of the many distinctive design elements include rich textured plastered walls; elegant sconces; two imported fireplace surrounds depicts an European flair; all tile porcelain floors-no carpet; plantation shutters; Alderwood cabinets&upgraded interior & exterior doors. Added light niches add character & charm. The gourmet kitchen offers tumbled marble back splash; Alderwood cabinets & custom hardware;sculptured chimney over cook top; colorful pendant lighting; stainless steel appliances-newer double ovens≠wer microwave.Guests will enjoy the 2 room Casita with the welcoming courtyard entry&patio entertainment area.2nd rm.in Casita could serve as a 4th BDR. The backyard is complete w/an enticing pool/spa & built in BBQ offering breathtaking views of the fairway & Santa Rosa Mts. Water District Coachella Valley Water Dist. 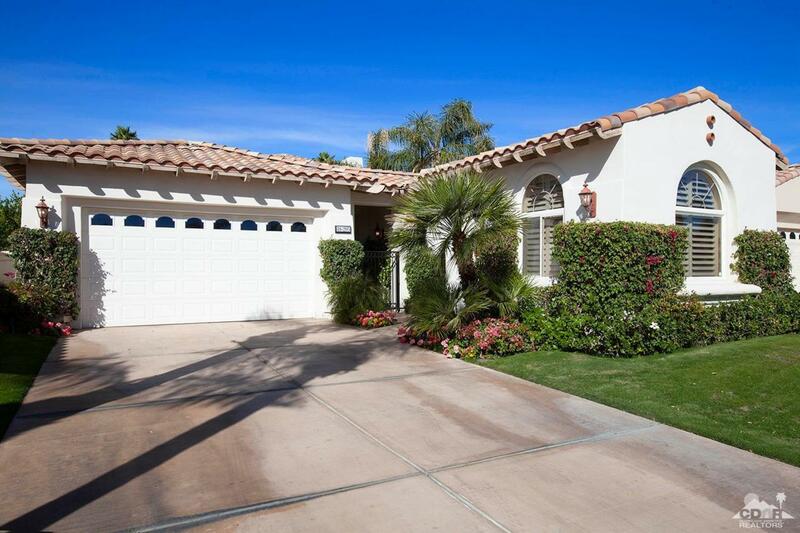 Listing provided courtesy of Joan Bardwell of Rancho La Quinta Properties.